This program has been cancelled due to ongoing severe weather. We are working with our partners to reschedule. Please be safe. 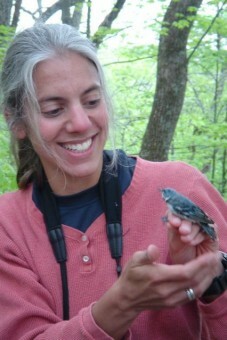 Dr. Amanda Rodewald is the Director of Conservation Science at the Cornell Lab of Ornithology. Dr. Rodewald’s many research interests revolve around ecology and habitat management in human-dominated landscapes both here and in the tropics. Through a media-rich presentation, we will visit with beloved species such as Mourning and Cerulean Warblers and Summer Tanagers on a Colombian coffee plantation. Learn how your consumer choice of shade-grown coffee benefits not only neotropical migrants wintering in Central and South America, but also the communities that provide this important habitat. Interweaving biological and economic research findings with stories about people and birds, this accomplished researcher will illustrate how tropical forest management can support sustainable communities and sustainable habitats. Bird-friendly coffee samples will be available.